When a buyer goes to purchase a new smartphone, he or she is often confronted with a tough choice. With so many flagship smartphones in the market today, which ones to choose from? There's the Galaxy S5, which is a widely popular phone from Samsung and then there's the iPhone 5s, which comes from the world’s most valuable tech company. And, as if that wasn't confusing enough, Google offers its own flagship device known as Nexus 5. While the three smartphones mentioned above are wildly popular, users have a tough time investing their hard-earned cash into. That's why, we've written this article to help you buy the best phone amongst the big 3. So, without further ado, here's a quick comparison between the Galaxy S5, Nexus 5 and iPhone 5s. As far as the features go, on paper, the Galaxy S5 is a clear winner. It has a fingerprint scanner, heart-rate monitor, and all sorts of other cool stuff. However, as far as useful features go, it has a hard time keeping up with the iPhone 5s and Nexus 5. Both the iPhone 5s and the Nexus 5 come with all the essential features you need from a true smartphone. Be it mail, camera, gallery, photo sync, both the Nexus 5 and iPhone 5s put a huge focus on their core apps and definitely it pays off. Users get what they want right from the start. No confusing menus, no extra gimmicks, and just pure smartphone experience. In comparison, the Galaxy S5 suffers from a bloat of menus, options, and unwanted features that might confuse the traditional smartphone user. It is safe to conclude that Samsung has a lot to learn from its competitors when it comes to caring about the core features that user completely rely on. 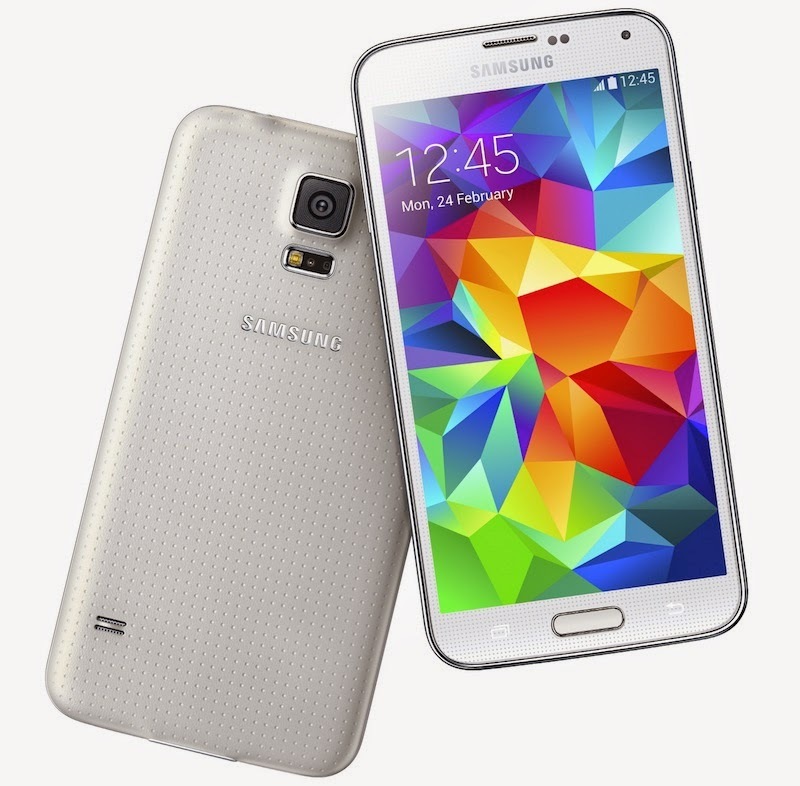 The Galaxy S5 relies heavily on the TouchWiz UI, a heavily customized version of Android. Though looks fancy, it does look kind of outdated when compared to iOS 7. Apple's recently revamped operating system looks like a beauty in comparison with Galaxy S5's UI. With a flat design, perfect icons, and a cohesive experience, Jony Ive's efforts seem to have paid off. Having said that, Google's vanilla Android doesn't seem to be that far behind when it comes to design. It looks sleek, it is easy to use, and has the minimalism that Google too is known for. The Galaxy S5, on the other hand, has changed only a few things from the TouchWiz UI providing nothing that is wow-worthy as far as design is concerned. Rumors are afloat about Google's design revamp for Android featuring a flatter design that has fewer gradients. Till then, the top spot belongs to the iPhone 5s. The Galaxy S5 is a true winner in this department. With a 5.1-inch screen, Samsung has clearly put a lot of effort in bringing the best display to its flagship smartphone. A Super AMOLED touchscreen and a resolution of 1080 x 1920 pixels means gorgeous pictures and color reproduction. On paper, this looks like a solid entertainment device; a phone on which you can play all your movies and TV shows. But, this is where Galaxy S5's another major flaw shows up and that is its speakers. A weak sound quality simply dampens the experience of watching a movie on the phone. Again, there is the option of headphones, but when the marketplace has the likes of HTC producing some fabulous built-in speakers for their smartphones, Samsung's lack of attention to acoustics leaves a lot to be desired. But, this being a comparison of displays, Samsung still rules this category. The iPhone 5s and the Nexus 5 both fail to match up to the amazing display The iPhone 5S comes with a LED-backlit IPS LCD with 326 ppi. For its size, which is a 4-incher, the display is nearly perfect. A normal user won't need a better display from such a small screen. Finally, there's the Nexus 5, which comes with True HD IPS+ touchscreen. With a 4.95-inch screen and a resolution of 1080 x 1920 pixels, the Nexus 5 is almost as good as the iPhone 5s. That's why we have them both tied at the second spot after the Galaxy S5. Though most of the features are gimmicky, the Galaxy S5 does win here. With a fingerprint sensor, heart rate monitor and other cool features like Smart Stay, it does give the users much more than they asked for. The problem, however, begins when you start using the features. The Galaxy S5's fingerprint scanner is nothing like the one you find on iPhone 5s. It's clumsy, awkward, and difficult to get used to. We bet that you probably won't be using it to unlock your phone (unless in cases where you want to make your iOS-loving friends jealous). Also, the weird flicking motion you do to sift through your photos is another gimmick you don't want to use. Coming to the heart-rate monitor. It's a conveniently placed sensor at the back of the phone just below the camera. Put a finger on it and it will give you your approximate heart rate. Though sounds cool, there is very little to look forward to if you're a fitness freak. In cases where you do high-intensity interval training or other exercises where you have to constantly monitor your heart rate, the sensor at the back is almost useless. What does put the Galaxy S5 on top of this category is its water-resistant nature. Dropping it in a pool of water seems to have no effect on it. Even when you're cooking and want to use the phone, you can do so without ruining the display. It just works. Since the fact that phones have become an integral part of our lives having a rugged, water-resistant phone definitely gives you more bang for your buck. Coming to the extra features on the iPhone, the fingerprint sensor is absolutely well done. It just works out of the box and is conveniently placed unlike what you'll find on the S5. Other than that, you won't find anything gimmicky or extra in the iPhone. It's a complete smartphone and nothing else. Finally, the Nexus 5. This phone offers almost no extra features. No fingerprint sensor, no fancy applications, no heart rate monitor. It's just a plain vanilla phone. That said, what the Nexus lacks in the extras department, it makes up in other areas. This is the area where the Galaxy S5 wins again. It has a whopping 16 MP camera, which clearly dwarfs both the iPhone 5s and Nexus 5. Nexus 5, which was designed as a camera-first phone, has proven disappointing due to the poor power of the built-in camera app. This puts it on the third spot giving iPhone 5s a place above it. iPhone 5s's iSight camera, though is 8MP, performs exceptionally well with the optical image stabilization and the HDR mode that comes built right into it. When compared head-to-head with Nexus 5, Apple's camera is a clear winner. However, it's still no match for what Samsung offers. Quality-wise, we expected better low-light pictures from the S5, but again, it's much better than its competitors. Performance-wise, both the S5 and the Nexus 5 run on Android KitKat, which is heavily optimized for devices having memory as low as 512 MB. Theoretically, they both should perform almost flawlessly with the S5 giving a better performance due to its specs. However, due to the heavy customization that comes with S5, there is a bit of lag when using it. Though not noticeable, it is quite anticlimactic for the performance-focused phone by Samsung. It has a Quad-core 2.5 GHz Krait 400 processor with 2 GB of memory, but the TouchWiz customizations and the huge amount of applications that it comes built-in with simply hogs the resources. The performance of both iPhone 5s and the Nexus 5 is somewhat equal when compared to the Galaxy S5. The result: we have all the three phones tied at the same spot. The iPhone 5s is a clear winner here. Its carefully crafted aluminum body and solid colors make it a treat to look at. Also, the perfectly placed ring of the home button gives the iPhone a solid feel. Coming to the Nexus 5, the design is sort of understated. Either you get the black look or the Stormtrooper look with the white one. 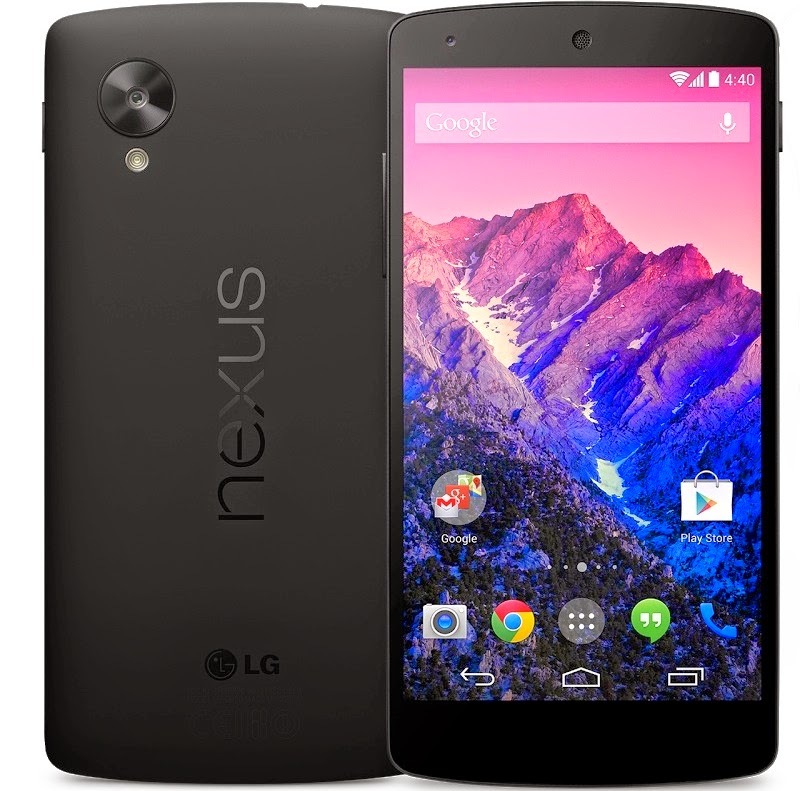 Overall, with the rubberized matte finish on the back, the design of the Nexus is highly appealing. However, when compared to the iPhone 5s, it's still a fabulously designed phone. Now, when you take the Galaxy S5 and compare it with both these smartphones, you'll find that for its price, Samsung's flagship phone is highly disappointing. The dimpled cover at the back is made of plastic; a design choice that seems rather weird when compared to other competitors like HTC One and iPhone 5, which come with a completely metallic body. The bezels on the edges make the phone look just like its predecessor, but only a bit larger. In the design department, it is safe to say that the Galaxy S5 is a huge letdown and we hope that Samsung puts some serious effort in bringing out a great phone with a great design. 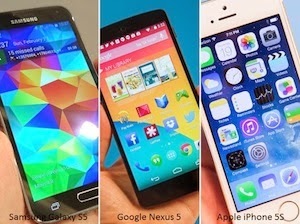 Unless you are a die-hard Samsung fan, both the iPhone 5s and the Nexus 5 are fabulous smartphones. They both offer amazing features out of the box. 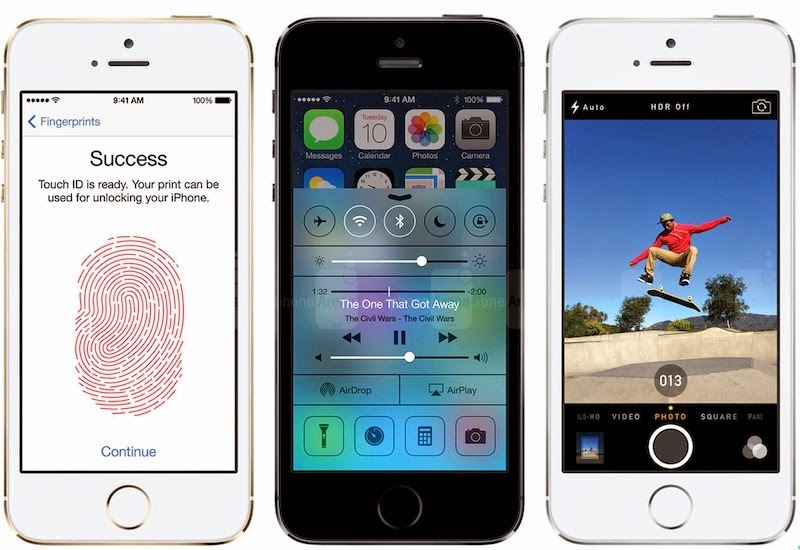 If it had to come to choose between the three, the iPhone 5s is a great all-round phone. However, for people who value freedom, the Nexus 5 offers the same goodness without any compromise on the features. This somehow sheds light on the fact that despite the hype of the Galaxy S5, the Nexus 5 and the iPhone 5s are the pinnacle of what the smartphone industry can offer.